But seriously, folks – do NOT trivialize the importance of good planning! (waaay more important than useless dusting!) Good garden planning can help you curb impulsive purchases (note: I did not say eliminate) and in the long run, save you money (see my Reality Check Blues Rules). By looking at what worked (or not), thinking about what you might like to change or try, and planning your plan of attack for 2011, a little retail therapy is completely justified, if not required. Of course, modern technology makes buying plants & seeds dangerously easy. I will be adding more to my list of favorite seed catalogs, but in this post, I’d like to highlight one small seed company that really made my garden outstanding last year: Renee’s Garden Seeds. Renee Shepherd is an absolute inspiration. She travels all over the world to learn more about the connections between the fruits and vegetables we eat and the history and cultures of the peoples who grow them. She donates seeds to school and community gardens all over the US and also in Uganda, Nigeria, Haiti, the Honduras, and elsewhere, showing what a big difference we can make with a simple seed. She offers heirloom varieties, cottage garden flowers, gourmet veggies from around the world, and kitchen herbs. 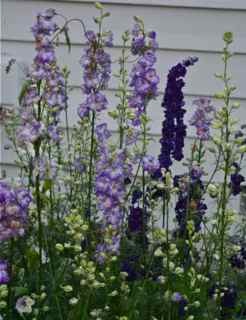 The website is packed with garden tips, garden plans, advice, and last but not least, recipes. 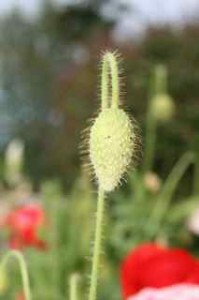 And you will find more info on the seed packets than you do in most garden books. No – I am not paid to be an advocate; I am just a big fan. Truth be told – my gardens have always been very functional. Fruits, vegetables, herbs. Lots of garlic. Not a lot of flowers for just pure enjoyment. 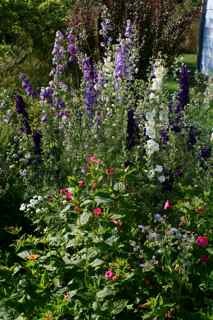 Last year I changed that by trying out Renee’s “new for 2010” series – and I can’t tell you how much joy it added to my garden – not to mention bees and butterflies! 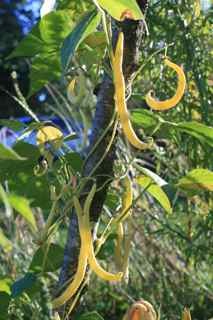 Did you ever notice the hairs on the pods? 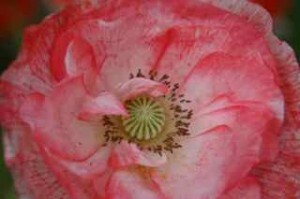 Up close – exquisitely complex and oh, so delicate! A newfound love affair with something so simple and so endearing! I planted this batch in a little square outside our door that was notorious for persnickety weeds. I really didn’t think they’d make it but didn’t know where else to put them. 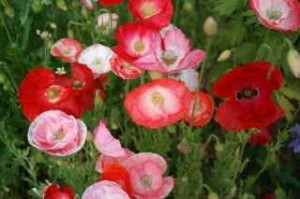 The poppies prevailed and made me smile every time I walked by. 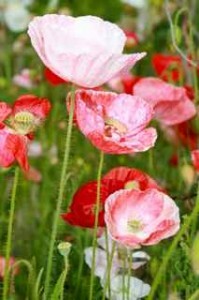 This year, I will plant even more – and also mix in something that will bloom after the poppies are done. Also in there that you can’t see are some adorable “Jack & Jill” Sweet Peas, which did not get the recognition they deserved (had I read the seed packet more carefully, I would have realized they are a short variety). This year, I will plant them in a pot that I can keep on the deck – and will probably order some others as well, as Renee offers 26 varieties of sweet peas alone! Who knew? Mixed flowers – definitely Outside the Boundaries! 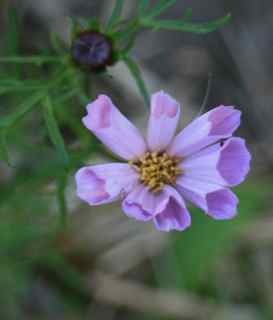 “Rose Bon Bon” Double Cosmos -these bounced gently in the breezes. I will give them a more prominent spot next time. They bloomed for such a long time! Remember my last post where I thought I would establish boundaries in that little plot by the driveway when you first come into our yard? Ok – it didn’t look like much – a little rhubarb starting to emerge in the foreground; Ginger Roll, the hefty yellow lab, was the most noticeable feature. Here is the “after” picture, and not sure you can tell, but there are Larkspur, Cosmos, and Four O’Clocks, all from Renee’s Seeds, along with some short sunflowers surrounded by marigolds, columbines, a little garlic, and a squash plant that volunteered from the compost. It was the cheeriest place on the whole 2 acres. “Dawn Star” Heirloom Morning Glory – I did not doctor this picture – they truly glowed when the sun was at just the right angle. Awesome! Now here’s something that normally I NEVER would have planted because the wild version is such a strangling weed in my garden: Morning Glory. 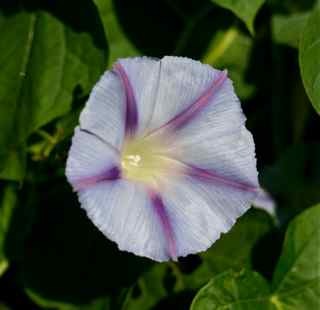 This one is called “Dawn Star,” and I planted it near my bean trellis. Talk about jaw-dropping gorgeous! “French Gold” Pole Filet Beans … mmmm … a golden treat! In the main veggie garden, I planted several of Renee’s beans. Rattlesnake and Purple Pole beans were prolific and provided us with fresh beans even after frost. I wrapped a sheet of clear plastic around the trellis and they just kept on growing. We also planted the French Gold – mmm – what a treat! 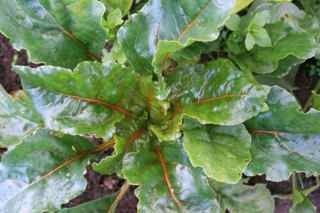 Also very successful for us, the Golden Beets (a nice change for a family who “thinks” they don’t like beets and discovered otherwise), as was the Sea of Red Lettuce, which provided VERY striking contrast in the garden and was extremely prolific – course, our spring was perfect for lettuce crops last year! (Sorry! No picture!). The Sweetie Baby Romaine (container lettuce), however, did not do as well for us, but it wasn’t the seed’s fault – I planted this miniature variety in a pot on the deck, where it got too much sun and too little water. Also didn’t work well for me: Spanish Padron Tapas Peppers, which I should have left in the greenhouse. Although I did manage to get 2 little peppers out of the guy, the cold wind took its toll. 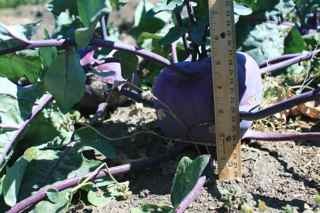 The flying Purple Kohlrabi has landed! 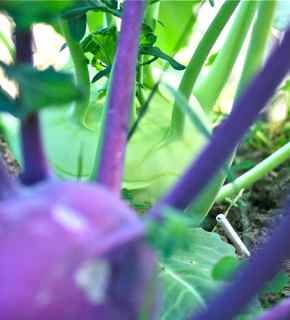 Enter the Kohlrabi Forest (“Crispy Colors Duo”) – easy to grow! 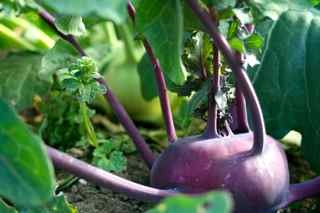 Be aware – kohlrabis can get huge! Still good to eat! The real showstopper, though, in the vegetable world was “Crispy Colors Duo” Kohlrabi. Wow. We had never grown kohlrabi before – they were like some kind of alien spaceships. The trick, I found, was to harvest them when they are small. If you wait until they are gargantuan (ahm! ), the skins are a little tougher to peel, but they are still crunchy and sweet. I was expecting more of a turnip-like flavor – not so. Very mild – fresh or cooked. Worm damage was minimal, and they didn’t get the aphids or slug slime that many of my brassicas and lettuces endured. I am a true kohlrabi fan now. I will have to look back through the seed packets to see what else we grew, but these were definite stand-outs. All highly recommended and I will definitely be making room for them again. 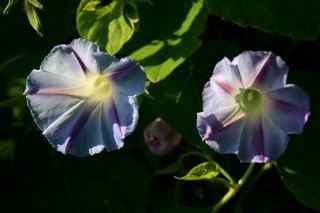 Check out Renee’s Garden Seeds – and just remember – the dishes can wait – but please, let in the dogs. It’s cold out there! Hello Barbolian Fields! Thanks so much for the kind recommendation – I shared your blog post with the Renee’s Garden team. You are quite welcome! I had spectacular results with Renee’s Garden seeds last year – I grew more flowers than I ever have before, which completely transformed my yardscape – tried veggies I’d never tried, which fed my extended family & some donations to the local food bank – and I just wanted to say thank you and how much I appreciate the outreach work you all are doing across the country and around the world. Simply outstanding! So very inspirational how we can make this world a better place!